You actually sent me blurred pictures, as you told me you had some trouble with the iPad and the laptop, and I see an orthogonally disposed set of tapes, along with fascinating walkmen! There’s maybe a connection. In this era of hyper-compressed beats and HD sounds, you’re surely not the only one who loves the crackling and hissing warmness of cassettes. Why? The tapes have always been with me. I am used to the sound. There are of course qualities in the sound of tape that I welcome when composing pieces. I had to look up crackling. It means a sound made up of a rapid succession of short sharp noises. Iiiiigghhh. I don’t like that at all. Hiss is not a sound for me. 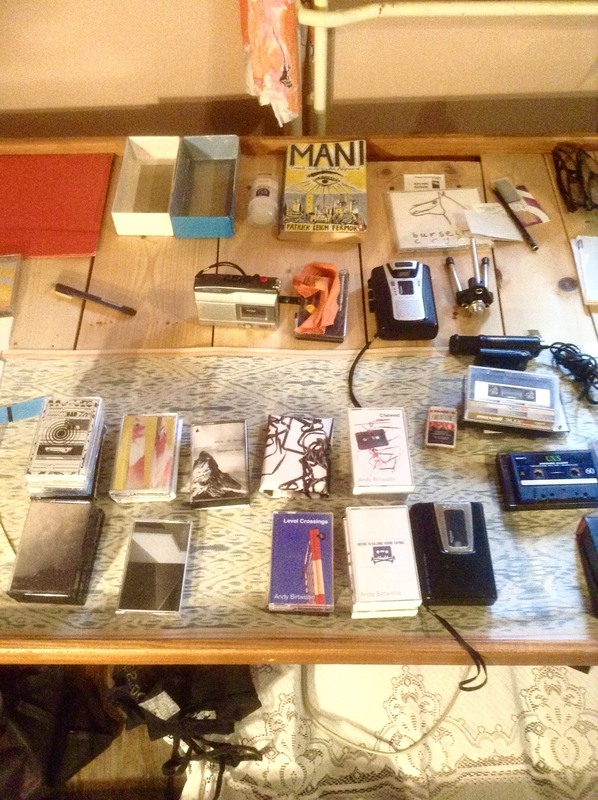 And maybe everything on my tapes is not primarily a sound, but rather a recording of something that happened in the past, or like in the case of hiss, a reference to the passing of time and the layers of experiences that get drowned by our memories. Yes, everything stored on hard disks and on your computer has the same quality. 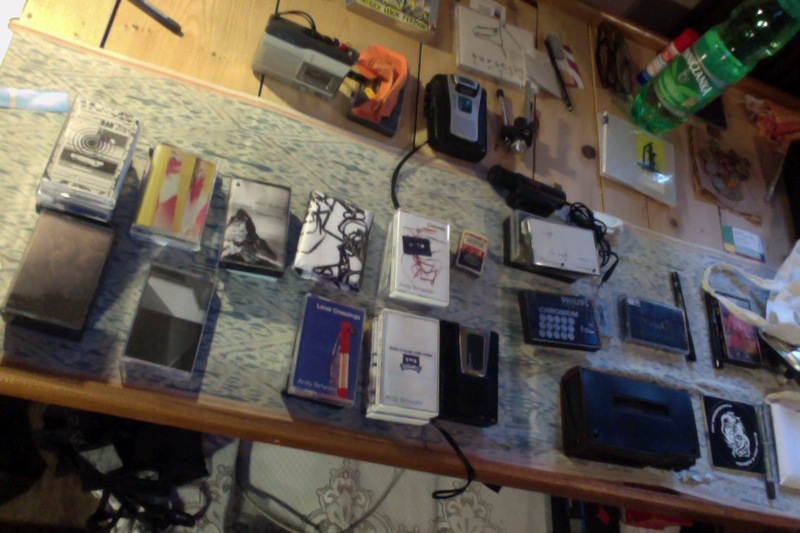 But there is something in tape that gives one the sensation, that, in a way, these recorded things are still happening, as if the tape is the only time-travelling device that was ever made, so far. Have you always been like this or did you get in and out from the digital sound of CD? I don’t have much experience with digital sound. I edit pieces for Radio On Berlin, because the transmissions are digital. I record on tape and I compose on tape. But on a commercial level, way back in the 1980s when the CD was introduced, I was one of the many who got fooled by the medium. It felt like the arrival of a new era. Little did we know that it would evolve into the CDr, which at one point was, and perhaps still is, like a plastic disposal bag for anything data. The sight of CDs in garbage left on the street or on a flea market is an image of sadness. It makes me curious, sometimes excited, when I spot a cassette. Do you also have CDs or nearly refuse them (I see a pair of them on the back)? I have two shoe boxes full of CDs. They are all at the Radio On studio, and never get played. 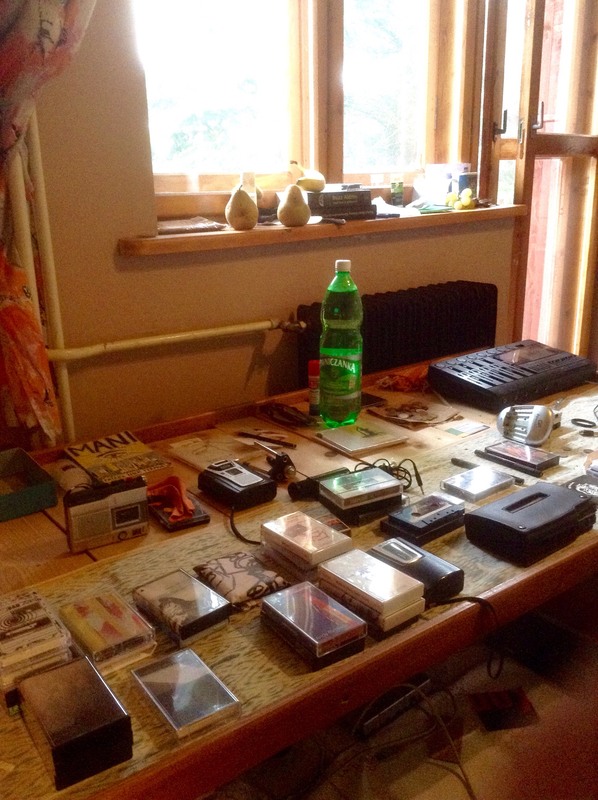 The CDs in the picture are my own (play Alvin Lucier – “Chambers”) that I made with Michal Libera. The other one was sent by Dai Coelocanth, I think in April-May. It is still in its wrapper. People keep on giving CDs. It is a gesture, isn’t it? Rinus Van Alebeek is writing a book about his experiences in Calabria and Poland and when this one is finished he will write another one. He does not make music. At least now.